Seventy two days away, so I need to get going on costumes. My last embroidery project took about 48 hours, but this one is less involved so I'm guessing twenty. We'll see how accurate I am. I cut the pieces for the two shirts; a white collared long sleeve for the solo program, and a blue velvet short sleeve affair for compulsories. What won't be sewn for awhile went into a storage size ziplock bag to keep it pressed and clean. After talking with another Coach who gave me this look of, "don't even try it in nonstretch," I changed my mind and decided to go with a lycra for the white shirt. Maybe with some good pressing I can get a clean look. 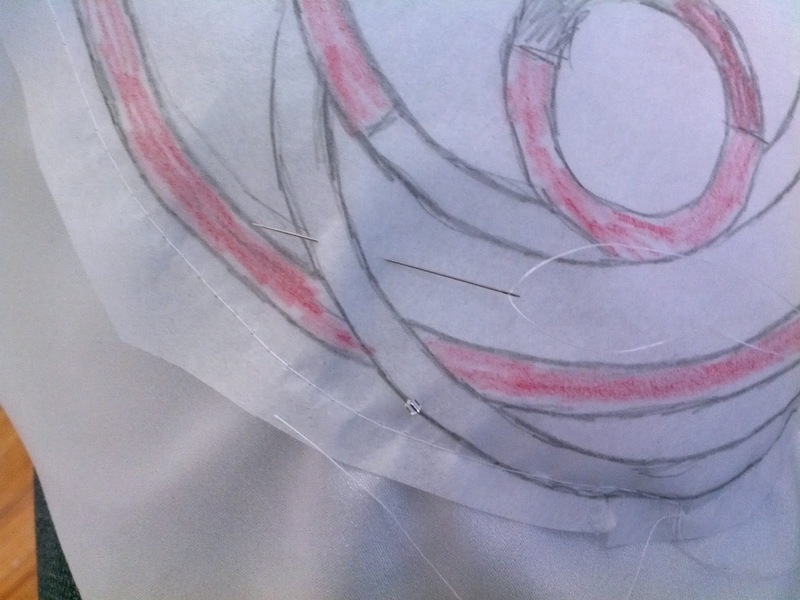 The thing to remember in sewing stretchy things is not to stretch them while sewing. This means no tugging, pulling, or coaxing it through the feed dogs. Just let it feed itself, watch it close, and go slow. When you are called to stretch the fabric while sewing, think of it the same way as crossing the streams with a proton pack. It can work, you just have to be careful. 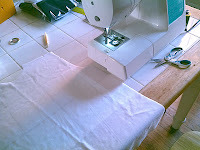 I don't have a serger, so I overlock everything and I get great results. But we're not sewing today. We're getting the bead embroidery started on the back panel. 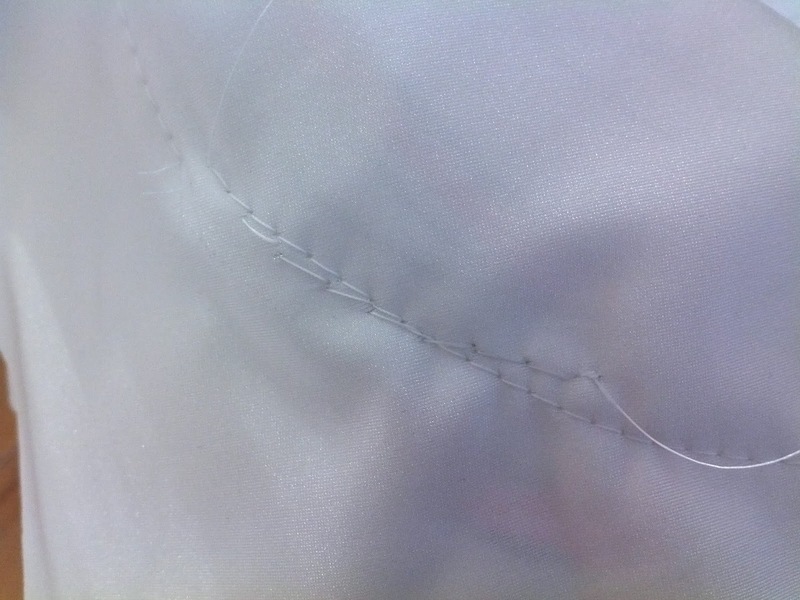 Here's our overlocking in action. Note that I've got my Edge Foot on there to make things easier. 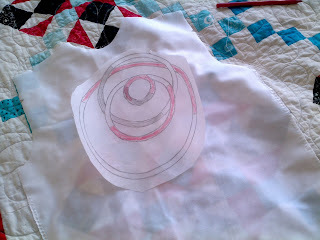 Here's my design, transferred to a piece of tearaway embroidery interfacing. 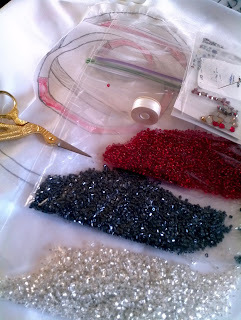 You're going to sew the beads right onto this stuff, and pull it off when you're done. (It works, really.) Center it where you want it, and pin it down. With the straight stitch setting set to the longest it can go, baste the paper design onto the back panel. Go slow, don't stretch, and try to make sure everyone lies flat together. 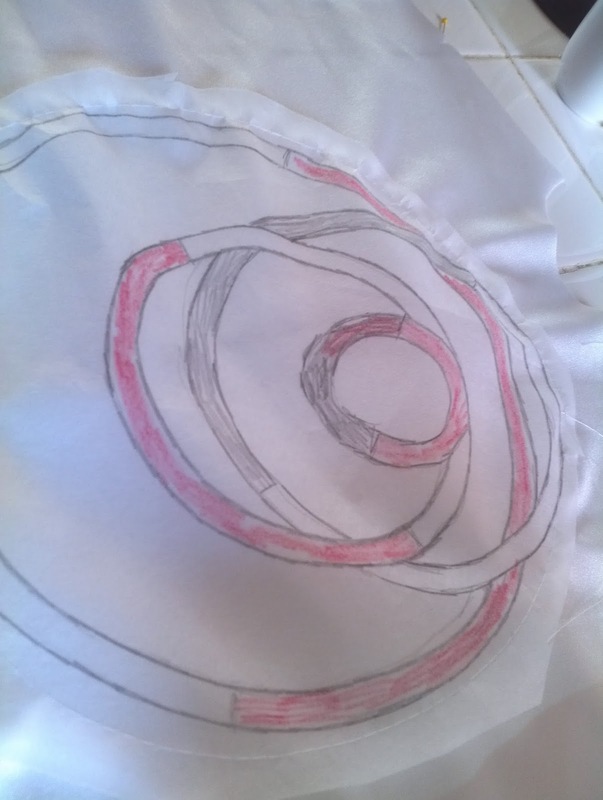 Here's our paper design basted onto the back panel. There's a bit of puffiness towards one edge, but I'm not worried. 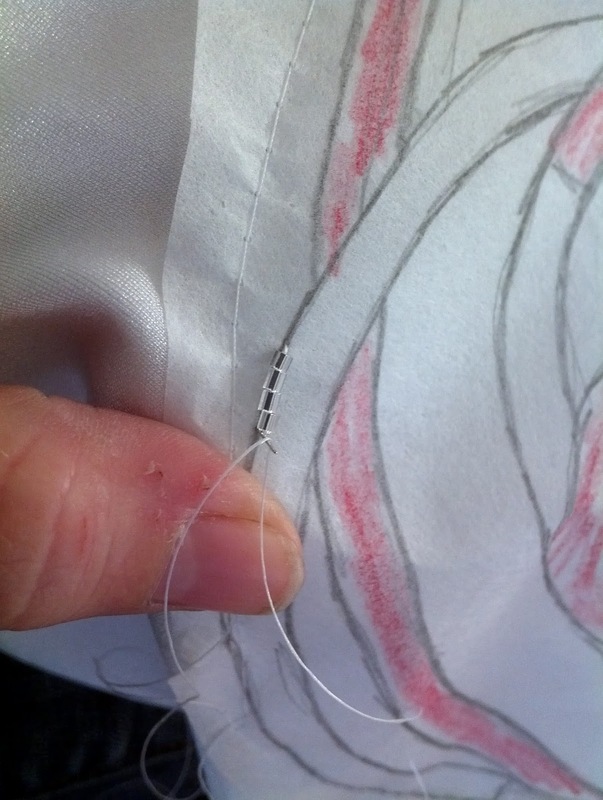 The beading will take care of things as we go, provided we pay attention. These kinds of small errors are also okay, provided there aren't too many of them. As the beads go on, things will flatten out. Here's all my beads and materials. My beading thread is a white Nymo, size B, a smaller gauge of the stuff they use to make shoes. Everything is packed up in baggies so I can easily take it with me, and I don't carry all the beads of the colors around, lest disaster strike and I spill a bag. (It's happened.) I only carry manageable amounts. Keep it organized, and work only with one color at a time to save your sanity, not going through multiple bags for one bead of one color and two beads of another. Start with one bead. 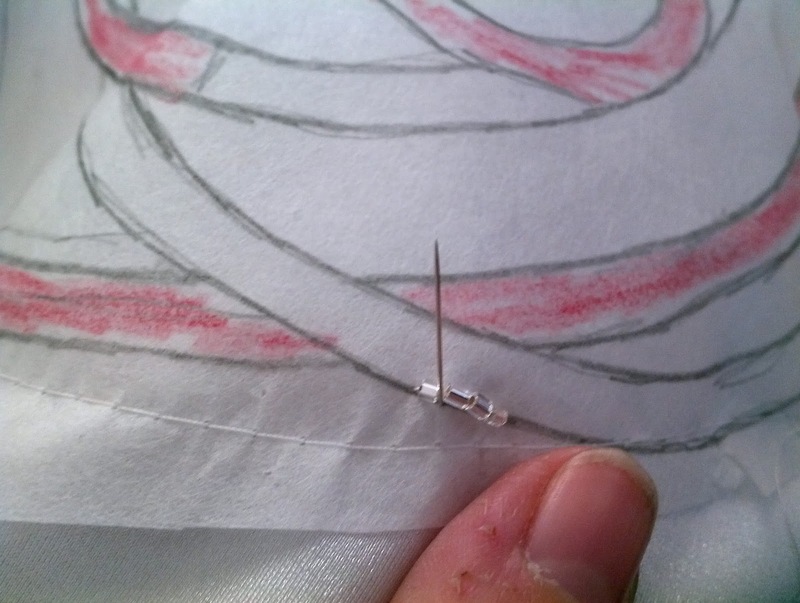 Just pick a point, sew it on, and secure it on the back with a surgeon's knot. Here's the back view, and the knot. Don't worry too much about knots not holding, we're going to secure every stitch and knot when the entire piece is done with a flexible acrylic. 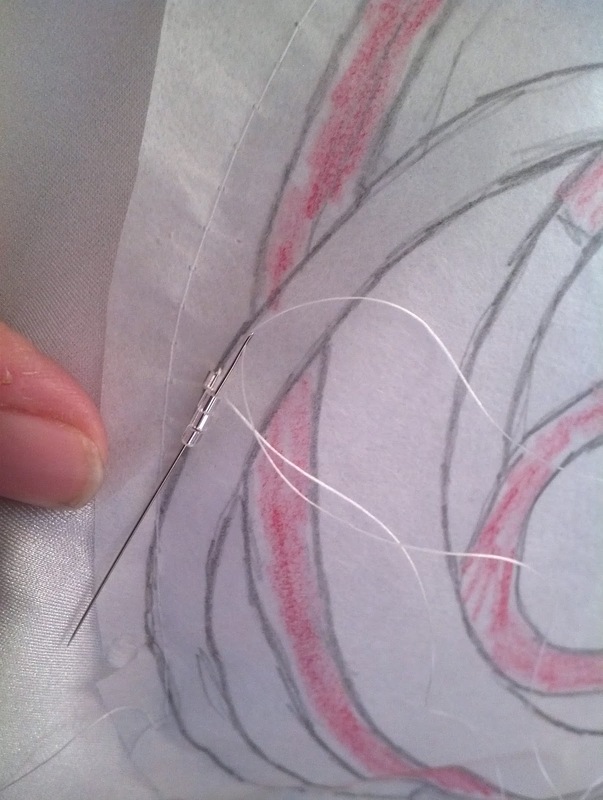 Bring your thread back up behind your first bead, and thread through it so you're coming out if it, as shown here. Pick up three beads of the same color, and snug them against the first bead. Send your needle down through the fabric so the beads sit nicely against that first bead. They don't have to be really tight together, doing that can cause puckering and mounding. Just try to have them lay flat against each other. 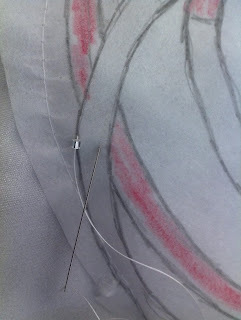 Bring the needle up between your first bead and the new beads, and thread through again through the new three beads. Just like that. After this, it's lather, rinse, repeat, over and over again. Fill in, three at a time. When you need to add thread, tie off and back on again with sturdy surgeon's knots. Get rid of the tails, they'll drive you nuts. Flip it over and look at the back every now and then. The back does matter. You want it clean and neat. 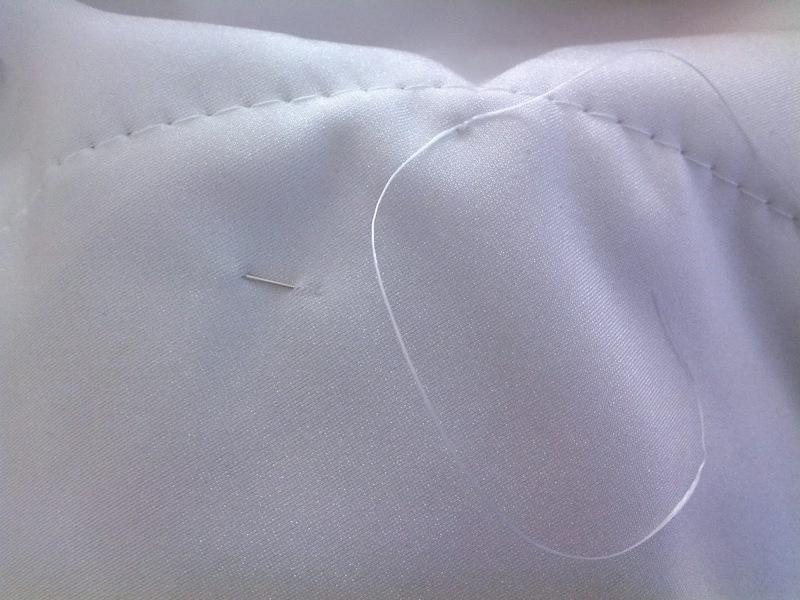 Places where the thread has knotted, gathered, frayed or whatever else thread does to irritate you means weak points in your beading. Weak points mean things can fall off, and that means disaster. When you make mistake, (this is going to hurt) rip it out and start again. And we're on our way! See you in a few weeks! Wow, that beading looks like it will take forever! If you are interested in a serger, I highly recommend the Brother 1034D. It is extremely affordable, and I learned how to use it very very quickly, very easy. It completely transformed my sewing of knits, even though I thought I was doing okay on my sewing machine (which was kind of crappy, I've since upgraded). 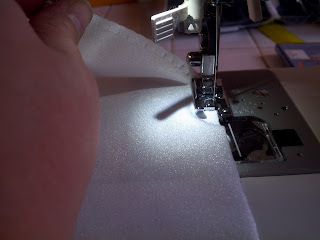 It also sews SO much faster. Anyway, as for the shirts - I have seen some people who take a regular shirt and attach it to a stretch part for the bottom for the boys. 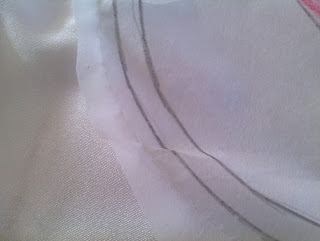 For a lot of the dance skaters (who wear tux-like costumes) they cut just the shirt front for the crisp look, then use stretch material for the rest of it - the bottom and back of the shirt, with different stretch material for the pants and the jacket. For just a shirt it is probably better to go the all stretch lycra route. 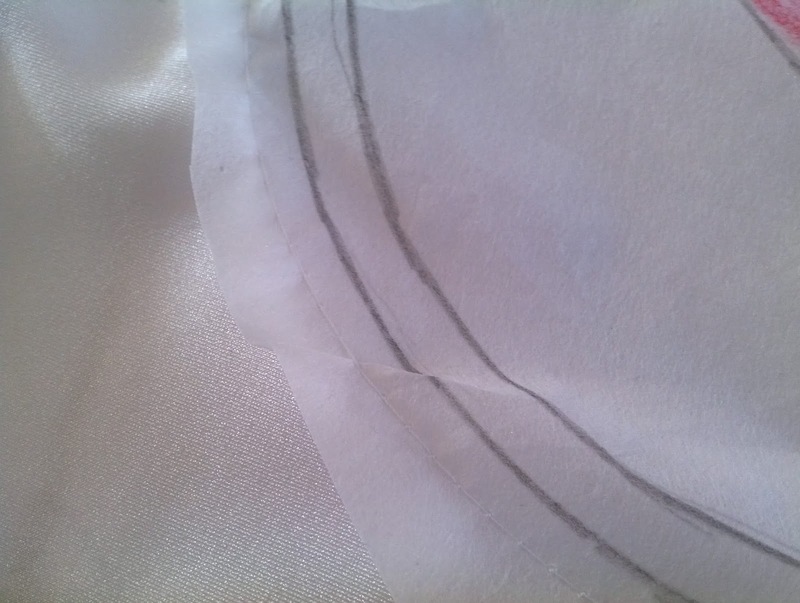 You could try using interfacing in the collar section so that it has more shape, then maybe tack down the collar ends so that they don't flap about during jumps or spins. Also - wow on the embroidery! I have done a lot of hand beading on skating costumes, but not with such small beads. Can't wait to see the finished results! 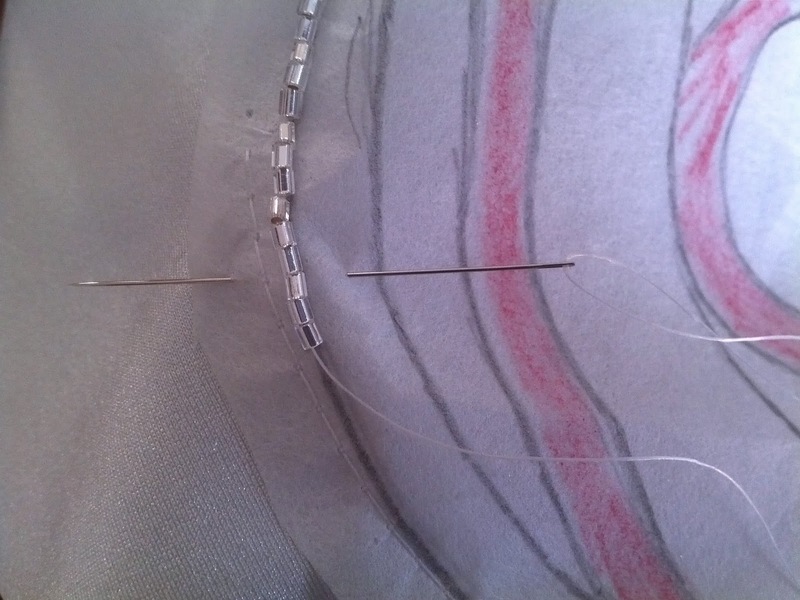 I haven't even looked into a serger, but thanks for the tips, guys! I worked on a borrowed Brother before investing in my Singer, and I think they're fine machines. 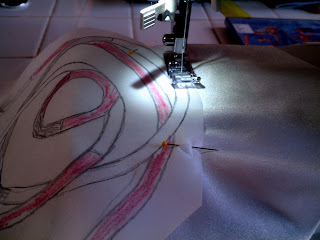 The embroidery goes faster than you think, especially once you get a groove going. One thing I did forget to mention is to work from one side of the design to another; from top to bottom or left to right. This will eliminate odd fabric puffs or gathers between design elements. These beads are also silver lined, which I read has some ability to tarnish with age. I'm curious to know how fast this happens. Stitch is my guinea pig for tarnish!